I think Kenya is one of those coffee that baristas always remember. I’m almost positive that most partners first coffee tasting has to be Kenya paired with a lemon loaf. (I have done countless first impressions with this tasting) It’s one of those tastings that strikes you, one that you remember. Those intense citrus flavors, grapefruit most notably, take a coffee tasting to “this just tastes like coffee” to “whoa, this is intense”. Juicy and complex, Kenya has a high acidity and a medium body. Pairs well with blackberries, currant, and of course, grapefruit. 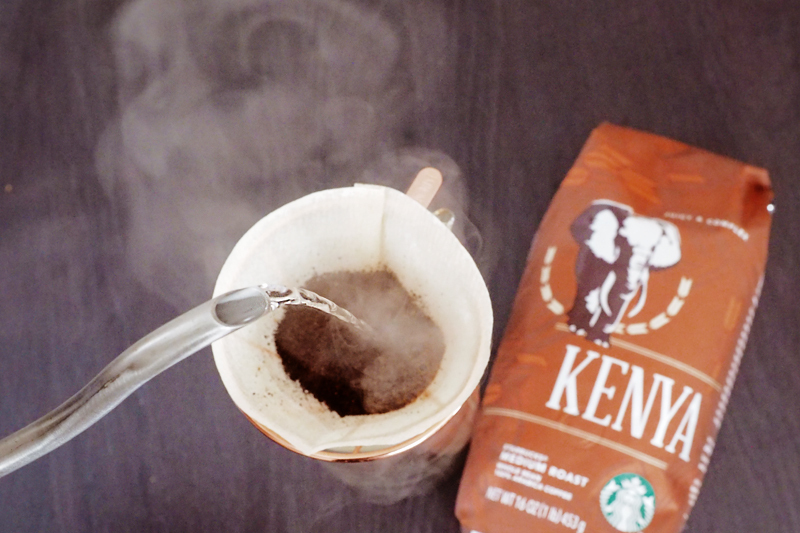 Kenya is one of those coffees that can stand up in so many different brew methods. I love it as a pour over, and for this tasting I used my toast pour over. It also makes an incredible cold brew. Perfectly crisp and refreshing. Making poptarts sounds like a lot of work, and it can be. You can make your own pastry dough from scratch… or you can just buy pre-made pie crusts. You can make your own marmalade… or you can pop over to Trader Joe’s and buy some. The choice is yours. While I do honestly love baking, sometimes, there are just not enough hours in the day. This is a quick and easy way to put together a coffee pairing that will impress! Unroll the pie crusts, place on a lightly floured work surface, and roll the crusts slightly with a rolling pin to square the edges. Cut each crust into 8 equal-sized rectangles. Place about 2 teaspoons of the pink grapefruit marmalade in the center of 8 squares, and spread the jam out to within ¼ inch of the edge of the pastry square. Top each with another pastry square, and use a fork to crimp the squares together, sealing in the marmalade. Use a knife to trim the pastries, if desired. Move the filled pastries to the prepared baking sheets. Bake in the preheated oven until the edges are lightly golden brown, about 7 minutes. Allow to cool on the baking sheets. Meanwhile, stir together the powdered sugar, milk, and vanilla extract in a bowl. Add a few drops of food coloring if desired. 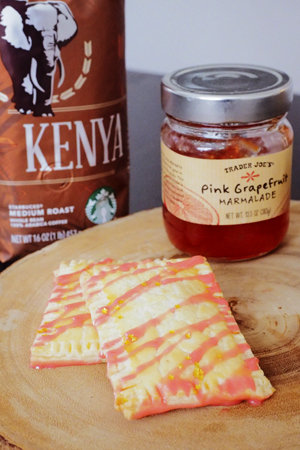 Spread over the now cooled pop tarts and garnish with sprinkles. *If you don’t live near a Trader Joe’s (trust me, I understand the pain as the closest one is 90 miles away) you can pick up some from Amazon. Thank you for all the great tasting ideas. I used Jiffy with the maple soaked bacon this morning with Sumatra. 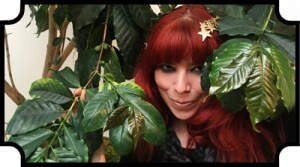 I am still trying to find my palate for coffee. I think I could smell earthy. As for taste, it taste ok alone and better with the muffins. I can’t wait to make the pop tarts. My Trader Joes is less than a mile away, and they had the marmalade. Thanks again for all you do for baristas and coffee lovers. So, today I was getting ready for my tasting with the poptarts. I purchased the marmalade from Trader Joe’s and the pie crust. I followed the instructions for the pie crust (leave in fridge blah, blah, blah). When I went to take out the crust it fell into many pieces. What to do???!! I made my own pie crust. So easy and so good. Everyone loved the poptarts! Thanks again.